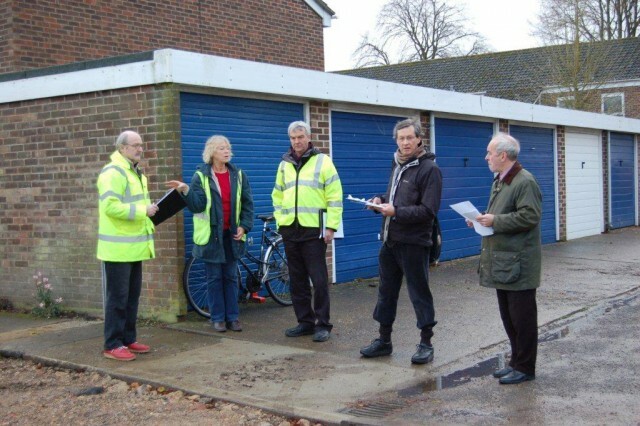 At this morning’s meeting, from left to right: Nick Hills (OFA), Susanna Pressel (City and County Councillor), Keith Lead (Environment Agency), Paul Kirkley (Oxford City Council) and John Copley (Oxford City Council). Also present were Steve Smith (Oxford City Council) and (taking this photograph) Andy Webber (OFA). A site meeting this morning successfully settled the operational details for the new flood wall and associated sandbag wall at Bullstake Close. Who will monitor flooding at the wall and the criteria for maintaining or reducing the sandbag wall have been agreed. Operation of the Penstock valves installed recently by Thames Water, to protect the drains of Earl and Duke Street from inundation from north of the Botley Road, was similarly considered and agreed. Personnel from Oxford City Council will be given the necessary training for carrying out these operations. A written plan will be prepared.